It’s worth noting that commercial induction cooktops use coils and a high-frequency alternating current instead or rotating magnets. They also are notoriously fussy about cookware, too. So, kudos to [K&J] for finding success with such an expedient build. As a next step, we’d love to see the permanent magnets replaced with small coils that can be electrically commutated, perhaps with a brushless motor controller. Next, a pedal powered one for a nice off-grid version. Don’t skip leg day if you’re going to try this. Good point. Plus it’s radiated heat, not conductive heat so it looses a fair bit of efficiency there too. someone needs to invent a more efficient toaster .. The guy’s legs are too muscular for best efficiency. He’s a sprinter. He can probably generate energy to power three toasters (but only for a short time). It would be better to find someone with less muscle, but with longer endurance. That was 700W! nearly a whole horsepower. I can not imagine, that any human could produce 3 times the power. What do you think the big coil is when you’re putting a current through it? I think it is an inductor – what do you think it is? And what happens inside of the inductor……. Bueller was at Wrigley Field. as he was wriggling his way out of class. When an electro motive force is applied to a conductor then an electromagnetic field is generated. However, like is said it is not a magnet it is an inductor. You are trying to allude to the fact that an electro magnet is doing the same thing as a magnet and that is both obvious and true but that there is a difference in operation due to the fact that you don’t need any moving parts because an alternating current is applied to the inductor in the case of an induction cooker. I await your snarky response…. Well, yeah. I think we all had that figured out all along. Nobody thought induction cookers used spinning magnets. Most of us here know what an electromagnet is. It even says so in the article, or was that edited later? There are moving parts in an inductor. They are called electrons. I’m glad you got rid of the moving parts, no more buzzing sounds when I need a DC-DC converter in the “wrong” frequency range! Q: Which came first; the electromagnet or the inductor? A: The electromagnet was invented in 1824. Electromagnetic induction was discovered in 1831 by Faraday due to his research into the properties of the electromagnet. Inductors are magnetic devices, and can even be used as inefficient electromagnets without modification. Thus, any inductive cook top by nature uses magnets. They don’t use permanent magnets as part of the cook top itself, however, which is what I suspect you were trying to say. This was also mentioned in the article. An inductor is not a “magnet”. It can form a magnetic field when you pass current through, but otherwise it’s just a loop of wire. Without this distinction, any conductive object would be a “magnet” and the word would lose meaning by being too vague to describe anything. Nowhere did I call an inductor a “magnet”. I called them “magnetic devices”. Ahhh, it’s only a magnet when electricity is flowing through it. Are we in practice here for the pedantic olympics? No information has been exchanged here. Everybody knew all of this all along. The only argument was over who failed to state the obvious in fine enough detail. When I were a lad people used to worry about conserving precious Internet bandwidth. Ha! RULE #1: Keep a firm grip on the darn pan! What if you like scrambled eggs. It clearly needs more magnets. Because everything does. Really cool demonstration, thanks! Something inspiring to show to young minds. With less distance between magnets and cookware you should achieve a stronger current? I was too poor have a “pet magnet” as a child, so now I have an excess of them, whether it is refrigerator magnets, or magnets removed from hard drives or magnetrons. I just keep adding to my collection when the opportunity arises. U.S Geological Survey probably has my property listed as “a magnetic anomaly”. made something similar to this some time ago, but with copper tube filled with water, the water boiled. their seemed little pull on the copper tube from the magnets, more of a twitch, at the frequency of number of magnets and rpm, I suspect a lowish power motor could boil water using a battery, say for campers, emergency use etc. But flapdoodling a bunch of magnets is always fun. Thanks for that! I always love a new word, and you really surprised me with flapdoodle since it is an old word! But the verb form might be new… well done! I don’t know why the magnets are radial instead of a radius. Eddie currents are from a “changing” magnetic field, not from a “moving” magnetic field that doesn’t “change”. This setup seems that it would have one Eddie current at the inner radius of the magnets and an opposite Eddie current at the outer radius of the magnets. Your problem is that you either didn’t watch the video, or don’t understand magnets. He uses a guassmeter to demonstrate that they have alternating upward facing poles. So yes, you get flux as the magnet plate rotates, and radial arrangement means they’re more closely packed and thus have higher flux. Technically they don’t even need to be alternating. The amount of eddy currents you get is dependent on the rate of change of the magnetic flux, not its polarity, so having the same polarity but varying field strength would also heat the pan. That would happen anyways since the field is not uniform. 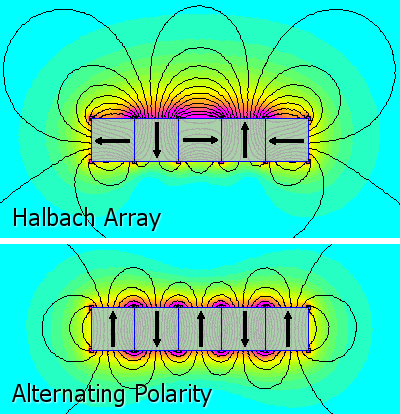 If you wanted to make it more effective, you’d arrange the magnets in a halbach array, which means every other magnet is actually facing poles sideways. This amplifies and extends the field on one side of the array while diminishing it at the opposite side. This would heat the pan even more. Sure, I was just pointing out how bizarre Rob’s comment was. Yeah, a uniform field would have zero flux, but even leaving aside the guaranteed nonuniformity, it’s not what the guy actually DID! Strange to be hungry after watching a Hackaday video? Don’t mock Southeastern PA. Except for Delco, because they deserve it. I’m not mocking it .. I’m living it! Only someone from the 215 or 610 would pick up on that accent! Now if we had magnetic chickens that laid magnetic eggs, they would cook themselves, ha ha. Doesn’t this depend on how hungry the dog is? The answer can only be “1,” because otherwise the word “if” would be rendered nonsensical. Cool demonstration, but I get frustrated by the way he’s explaining things. Constructive criticism, consider your audience. Anyone who didn’t already understand exactly what was going to happen from the thumbnail, wouldn’t understand most of the technical explanation. I think they would have had a lot more success had they used an iron or thick stainless steel pan. Material is more resistive, and would thus generate more heat. Induction cooktops specify these materials are best. In this setup it doesn’t really matter. In induction cooktops, it’s a matter of impedance matching a transformer with the secondary winding shorted out. You want the secondary to have higher impedance than the primary, so the energy is mostly dissipated in the secondary. With a mechanical setup, the “impedance” of the motor is already extremely low, and you can’t make it spin any faster, so you would actually need to lower the impedance of the pan to get more current flowing, to increase the braking force and load on the motor to get the pan heated faster. Cooking an egg and they didnt even go for plaid, not real Space Balls! Yeah, I had the same thought too. It would contain the magnetic flux in the metal backing plate and direct it through the magnet pairs, then up through the pan, completing the magnetic circuit. It would be worth testing. Wouldn’t a ferrous backing plate tend to shunt the magnetic field away from the pan? Is this setup producing a rotational torque in the pan, like in a squirrel-cage motor? I have to take issue with the statement that induction cooktops are notoriously fussy about cookware. They’ll work with a pretty broad range of material construction. It’s the cooks who are fussy about switching away from their unsuitable pans. You forgot the frame of reference, which would be a traditional gas or electric range. It is so much fussier than that, that you can’t even use the same range of pans! Whereas all the things it replaces, you can use whatever pan you want. Even the wood stove we cooked on when I was a lad would work with any of the regular pans, as long as you remember to leave any plastic handles hanging over the side and not directly above the stove. If there was no frame of reference, I’d agree; blame the tool user not the tool. But here, the other appliance technologies work with all the pans, and only this technology needs special narrowly-defined pans. So it is clearly at least an order of magnitude more fussy than what it replaces, even with fussiness not having an objective value. The only common method more fussy about pans than an induction stove is a raw campfire with no permanent cooking surface. And it only takes a flat rock to solve the problem. And more on point, what was the amount of work used? Are you making fun jokes because you didnt think of this yourselfs? An alternator with a shorted coil does the same thing! You can tell by the smoke.